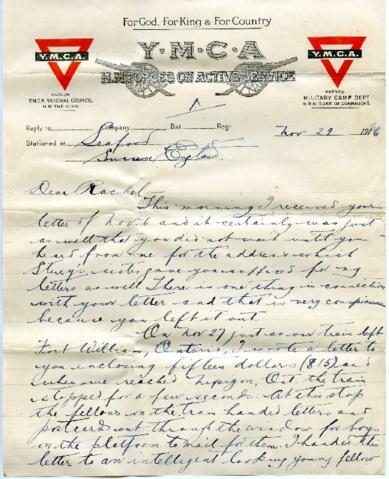 Letter from Private Edward Joseph Seidelman, dated November 29, 1916. Sent from Seaford, Sussex, England to Rachel Seidelman of Vancouver. Letter describes train journey across Eastern Canada. Private Seidelman also writes that it is likely his 196th Western Universities Battalion will disband soon. In another part of the letter, Private Seidelman mentions that he did not end up going to London as suggested in his last letter. Additionally, he gives a description of the town of Seaford and recalls seeing the estate of the Duke of Devonshire, the present Governor-General of Canada. In second paragraph Private Seidelman mistakenly refers to this train journey as happening November 27, actually occurred in October.